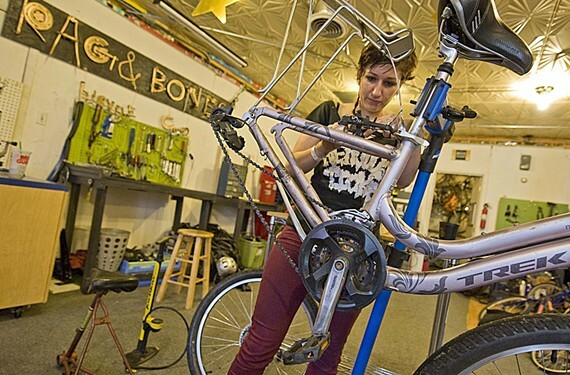 Rag and Bones staff member Sera Stavroula works on a bike in the Scott’s Addition co-op. It’s staffed by volunteers who offer space and repair help. When you roll up your sleeves and open a toolbox at Rag and Bones Bicycle Cooperative, you’re sure to feel more accomplished and self-sufficient. On the corner of Leigh Street and High Point Avenue, the shop specializes in teaching customers how to fix their bikes. You can purchase a used bike from the co-op for a super low price, but it will be in need of some TLC. That’s not a problem, because the helpful staff is there to walk patrons through the ins and outs of bike repair. The shop also offers the option to buy more expensive, but still fairly priced bikes that are ready to go, but we suggest you put your sweat into it and take the do-it-yourself challenge. The co-op has the larger goal of helping city residents be more mobile in a city with high poverty rates and limited public transportation. Linas says that the co-op serves those who need practical transportation but may not be able to afford bus transit or find it as convenient.